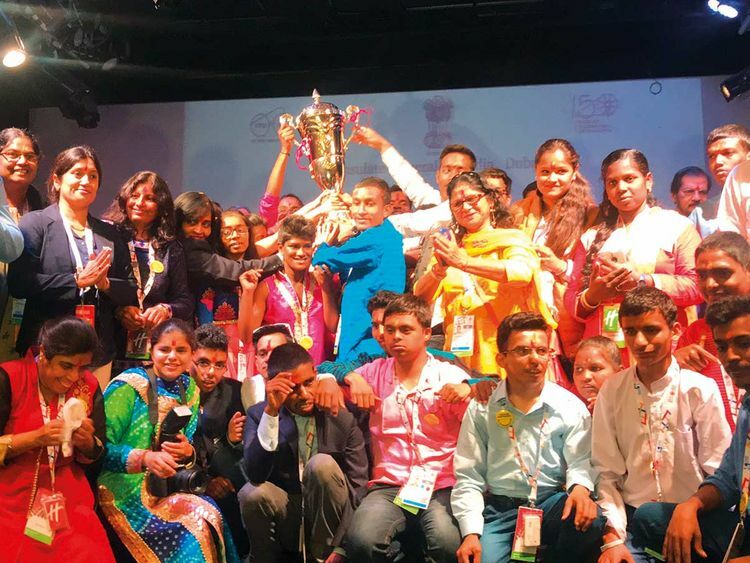 Dubai: Special athletes from India, who came out with flying colours in the Special Olympics World Games, got a rousing reception from the Indian expat community on Wednesday night. As the Indian Consulate in Dubai hosted a special reception for them to celebrate their showing, senior diplomats and prominent members of the Indian community welcomed more than 70 Special Olympics athletes with loud applause, floral tributes and a dhol (traditional drum) performance. They were also gifted with a trophy and goody bags. Excited by the festivities that fell on the day of Holi, the Indian festival of colours, the athletes were seen dancing to the drum beats and the patriotism-invoking Hindi film songs rendered by two Dubai-based artists. They also enjoyed the songs dedicated to them by Aisiri and Varun Raina, two children of determination who are members of the support group Prerna functioning under the patronage of the consulate. Some athletes like Dinal Jain, Lokesh Kumar Chandravanshi and Lalita Mona Uranw separately danced on the stage as the audience cheered them. Jain, who won bronze in butterfly stroke in swimming, was in the limelight with her dancing skills. She promised her coach Chanchal Sharma that she will improve her performances to win gold medals for making her motherland and her parents, prouder next time. Sprinter Sejal Rajkumar Nayer, who won gold in the 200m race, said she was also excited by the surprise reception with dhol performance and dances. The youngest member in the more-than-250-strong Indian team, the 16-year-old said she was looking forward to more surprising receptions when the team reaches India. During the 150th birth anniversary of Mahatma Gandhi, he said it is important for understanding the need for an inclusive society in which people of determination are treated with equal opportunities and dignity they truly deserve. “They have made us all proud and made our Holi extra special,” said Pankaj Bodkhe, consul (Economic and Education). Community members were seen hugging the athletes and taking selfies and group photos with them. “It is a proud moment for us. We are so happy to see our country’s special champions here. They are a big inspiration for everyone,” said Vandana Srivastav.